The IQF show is coming back to CHICAGO!!! Laura and I will have our booth there – #930. Be sure and stop in and say hello. June 20 (Preview Night) – 5-9 p.m.
June 21 & 22 – 10 a.m.-6 p.m.
June 23 – 10 a.m.-3 p.m. Admission: $10 adults/$8 seniors 7 students. I will be manning the booth alone this year as Laura HAS to go on a cruise to Alaska or somewhere. Poor me. 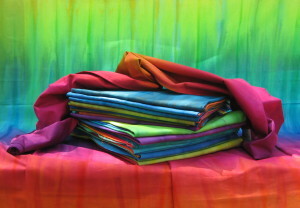 We will have our usual fare of gorgeous hand dyed cotton and silk fabrics. I will also have a nice selection of cotton/silk fabric and discharged cottons. There will be a fabulous selection of hand dyed thread, notions and patterns. I hope you are planning on supporting the show and I’ll see you there.